This dramatic image offers a peek inside a cavern of roiling dust and gas where thousands of stars are forming. 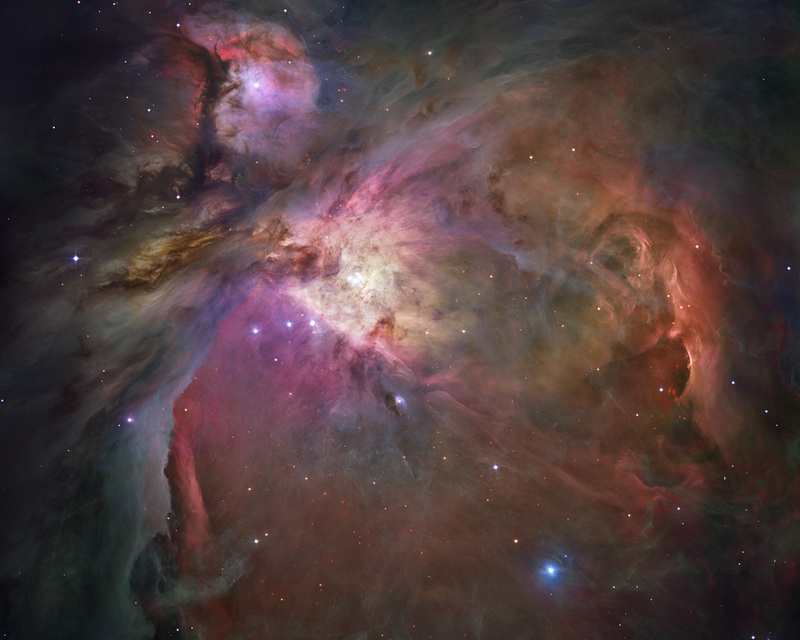 The image, taken by the Advanced Camera for Surveys (ACS) aboard NASA/ESA Hubble Space Telescope, represents the sharpest view ever taken of this region, called the Orion Nebula. More than 3,000 stars of various sizes appear in this image. Some of them have never been seen in visible light. These stars reside in a dramatic dust-and-gas landscape of plateaus, mountains, and valleys that are reminiscent of the Grand Canyon. The bright glow at upper left is from M43, a small region being shaped by a massive, young star's ultraviolet light. 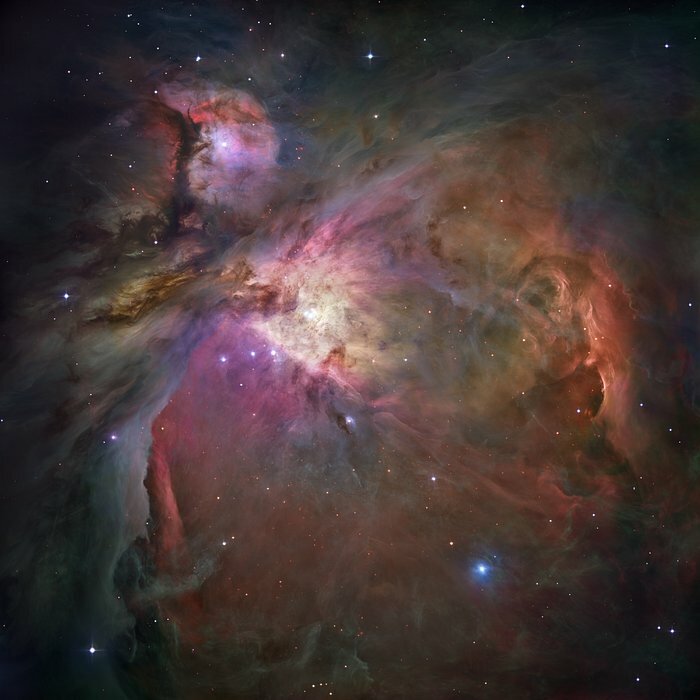 Astronomers call the region a miniature Orion Nebula because only one star is sculpting the landscape. The Orion Nebula has four such stars. 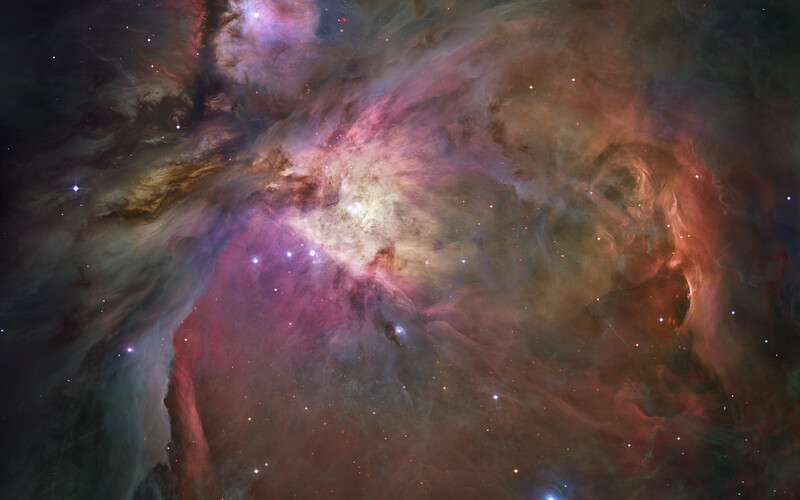 Next to M43 are dense, dark pillars of dust and gas that point toward the Trapezium. These pillars are resisting erosion from the Trapezium's intense ultraviolet light. The glowing region on the right reveals arcs and bubbles formed when stellar winds - streams of charged particles ejected from the Trapezium stars - collide with material. The Orion Nebula is 1,500 light-years away, the nearest star-forming region to Earth. Astronomers used 520 Hubble images, taken in five colours, to make this picture. They also added ground-based photos to fill out the nebula. The ACS mosaic covers approximately the apparent angular size of the full moon. The Orion observations were taken between 2004 and 2005. Position (Dec): -5° 24' 50.32"